Working closely with you and your business to achieve your personal and business goals. 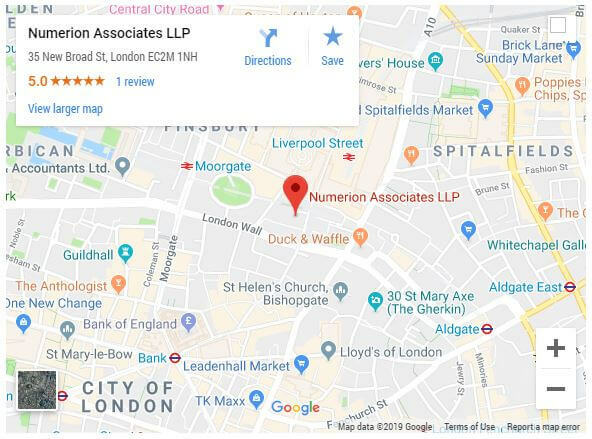 Providing peace of mind with straightforward, honest accounting, tax and business advice tailored to your circumstances – Numerion are the London accountants you can trust. Full range of services to business owners with more than £100k turnover to help them achieve their business and personal goals. Helping overseas businesses coming to the UK have the peace of mind with all their accounting and taxation needs. Talk to us at the early phase of your business start-up and we will provide the support and guidance you need. We are London based chartered accountants and are at our client’s side helping them achieve their business and personal goals. Consider us your sidekick! We provide a personal service with a direct line to the partners who make every effort to help you in a friendly and approachable manner without the fear of the meter ticking. We pride ourselves on giving straight answers to straight questions and work with clients on Twinfield, Xero, Sage and Quickbooks. The clients we tend to work with are owner-managed businesses or UK subsidiaries of international businesses, with fewer than 25 employees, with an annual turnover of between £100,000 and £10 million. We handle your annual accounts and corporation tax promptly, allowing you to focus on the vital aspects of your business. Taking care of your statutory and specialist audit requirements with minimum fuss and interruptions. Outsourcing your payroll makes commercial sense, with the knowledge that it handled by our qualified staff. Benefit from our bookkeeping service on our cloud system with automated workflow giving you access 24/7. Profit from years of experience without the cost of hiring a full-time CFO/Finance Director. Let us take care of your Self-Assessment tax return giving you the peace of mind that it is handled by experts.